A recorded pulse signal can be derived from a number of transducers, intended to detect the pulsatile flow of blood into the central or peripheral arteries. Typically, this is used as an indicator of heart rate, or as a timing signal indicative of pulse transit time. A pulse signal may be derived from various sources; a finger pulse transducer, IR plethysmograph, non-invasive pulse tonometer, pulse oximeter, microphone, or any transducer detecting changes in blood flow in localized circulation. A pulse signal can be used as a simple means of detecting heart rate, or utilized in a more advanced analysis approach such as pulse transit time. Higher quality pulse signals, for example, those deriving from a non-invasive pulse tonometer, may be used as an indicator of arterial stiffness. LabChart software is designed specifically for life science data and provides up to 32 channels for data display and analysis options that are powerful and easy to use. With auto-recognition of ADI and LabChart Compatible hardware, multi-window views, one touch recording, simultaneous recording from multiple devices, specialized preconfigured settings, easy sharing options and an interface that can be customized to show only the features you want to use. Use the detection preset feature in Cyclic measurements to ensure that you capture the signal exactly as intended, and are able to remove artifacts from your calculations as much as possible. 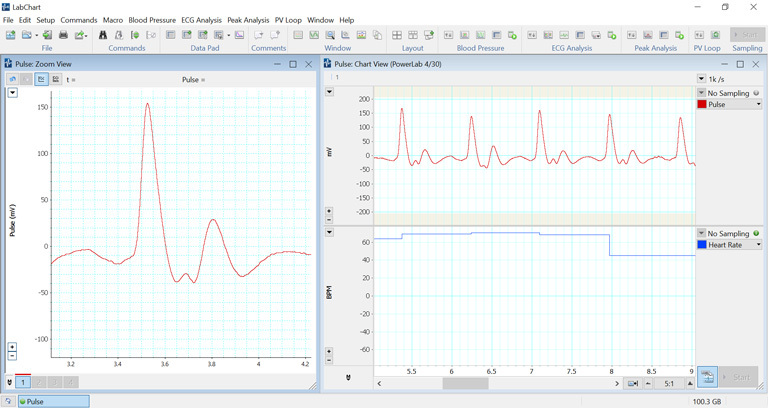 This tool combines flexible and clever cycle detection to create a simple to use analysis for periodic waveforms. checkmark Item successfully added to your quote request. Can be used to automate commands during recording. Record your actions for repetitive operations, or get under the hood and write custom processes in VB Script. The most flexible method of converting your time based raw data and calculations from the chart view to discrete values for use in statistical analysis. LabChart Reader is a free application for conducting limited analyses of LabChart data. Download a trial package with example data below. Thanks! Your trial package is now downloading. Once downloaded, please unzip the folder and install the LabChart Reader application. Open the "LabChart Data Files" folder to find data files (".adicht"). Data files can be opened in LabChart Reader by double clicking on the file name. Thank you for your interest in Pulse. Please complete and submit the form below and an ADInstruments representative will aim to get in touch within one working day. If you’d like to speak to someone immediately, office contact information is available from the contact page.